Please call office to set up an audition time at 828-322-2210. Openings in all sections. 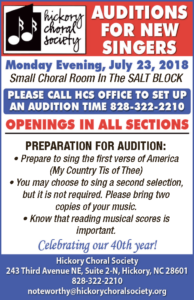 PREPARATION FOR AUDITION: • Prepare to sing the first verse of America (My Country Tis of Thee) • You may choose to sing a second selection, but it is not required. Please bring two copies of your music. • Know that reading musical scores is important.